So often I see staff in need of corporate coaching where the different in revenue would be felt immediately. In early October, my wife Gimalle and I visited the Calgary Home Show. It had been several years since we had last done this and I always enjoy these events particularly watching the never-ending product demonstrations. As we wandered around the many booths and displays, we stopped at four that piqued our interest. Each of these booths was displaying a product or service that appealed to us, and had we been in a store, may well have likely purchased it on the spot. In each case I gave my business card to the salesperson and was assured of a call the following week. I know the cost of renting booths for these events is extremely high. Even the smaller booths can cost thousands of dollars in addition to all the surcharges (e.g., electricity, water) that vendors may require. The outlay of cost for some appropriate corporate coaching or other training would likely pay for itself given the short period of time they have to make up their overhead. And yet, despite the long hours worked by these staff members and the high cost borne by their employers, not one of the four has yet to follow-up with me. If I owned one of these four businesses, I can assure you a corporate coaching call would have happened the following day. Last Friday I called a company that provides both products and services to our condo building. I arranged for one of their personnel to attend at our building on Monday and coordinated their attendance with electricians from another company to ensure that work we needed completed would be done. Needless to say I was assured the required technician would be present on Monday. Fast forward to Monday afternoon, a few hours after the scheduled work should have been completed, when I received a panicked call from a contractor overseeing this work. His call was to inform me that no one from this company had shown up, nor had they contacted him (or me) to say that were unable to supply the needed personnel. It is interesting to note that almost all conflict has a single source: conflict occurs, almost always, when expectations are not met. With the examples above, none of the agreed-upon expectations were met and I, as a both a potential customer and an existing one, felt underwhelmed and less than eager to continue any business relationship with these people or their companies. 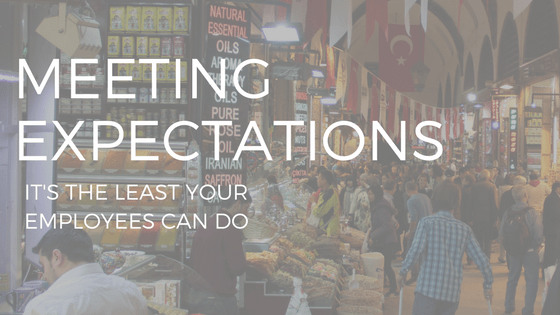 Here’s why this is so important: while we may think we are in the business of sales, or service or support, we are in fact all in the same business – our primary job is always to manage expectations. When we lose sight of this rule, the quality of our product, service or support and the value it provides becomes somewhat irrelevant. Yesterday I spent considerable time meeting with competitors of this supplier and we will be moving our substantial business to one of those contractors by the end of this month. The decision to do this is not predicated on the single events of Monday, but rather on a pattern that we have observed, and pointed out to this company, on numerous occasions. It would seem they have so many customers that keeping the existing ones is not a priority. And, needless to say, in the highly unlikely event that any of the people we spoke with at the Home Show contact me, I would be disinclined to speak with them. If you are a sales professional, employee, employer, parent, teacher, coach, manager, politician, or assume any role where you interact with people, it would behoove you to master the The Habit of Meeting Expectations. I assure you that you will make your life much easier, certainly more enjoyable and have a whole lot more fun in the process.